I mentioned earlier in the month about the Hallowe'en tree. Well, my lovely little Spudguns! here it is. In all it's horror. And I mean that in the sense that I have no business trying to decorate anything. Just one of those cheap little foot and a half things, bought at the dollar store. For someone who collects a lot of dren to do with Hallowe'en and vampires, I actually didn't have enough items to do the tree. I ended up having to raid my scrapbooking kits for some do dads and ribbon. The fangs and spider web are glow in the dark, and the tree topper...which was the hardest to figure out, is a broach. I actually tried to "make" some ornaments by printing out a couple of shots of the Addams Family and Dracula and gluing them onto some wooden bat cut outs. Only, they didn't work out as well as planned, so I only did two. And now I know why my family would wait to do the tree when I was asleep or at school; I am missing the Martha Stewart gene. So here's my promise to myself...collect better dren so that come October, you can do a better tree for Hallowe'en/the holidays. 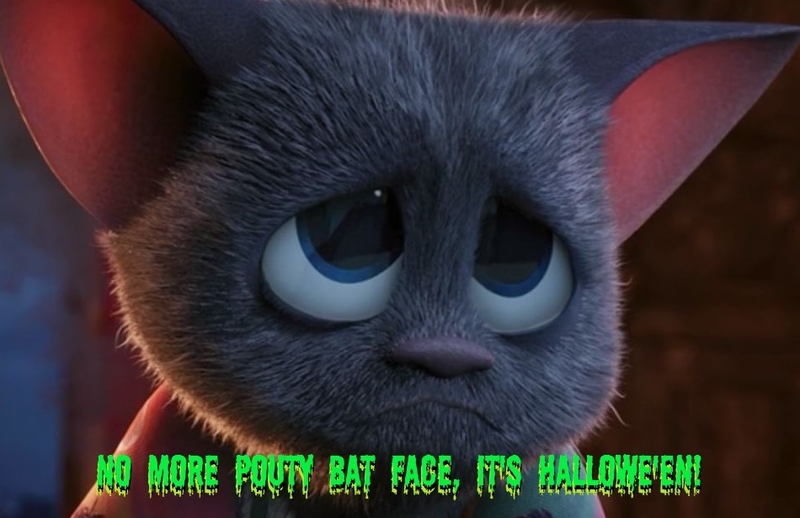 Just wanted to fly in here my little bat-droppings and wish everyone a happy Hallowe'en. And if you've missed my 13 Days of Hallowe'en on my movie blog, I have been mixing up the treats with posts both that are Hallowe'en recipes and movies. Days 1-12 are up, with Day 13 coming tonight. There's even pie. Spudguns! It's not yet 7am here this morning where I am, I'm up, not awake but up. I have been seeing the topic of tarot journaling everywhere lately. To me that is a sign that maybe it's something I should be thinking about. Only, I have a difficult time wrapping my head around the whole thing. That and to be honest, I find it a bit of a snore. Taking a deck and working with it for a few months or a full year, examining how each card makes me feel on a daily basis, then writing about it. Plus, it's another form of art journaling and that's just another branch of scrabooking. Haven't had a coffee yet this morning, so my blunt side is showing. What I have noticed myself in the past few weeks of general tarot use, is that the 9 of Pentacles and the 3 of Pentacles have been popping up together a lot. Both of these represent the end of a cycle and rewards. The 9 of Pentacles, also can mean weight loss/gain. Here's where this ties in this morning. If you've been reading me for long, you know I've had an issue with my weight over the course of things. I've admitted it more often then maybe I should have. I'm not sure anymore what it was I was trying to say...need that coffee...but I am trying to figure out more ways to bring the tarot into play here on this blog. That, and it's been a week since I posted on this blog so hence the ramble. I do want to talk about the weight thing too, only maybe today isn't the day for it. So if witches are the new zombies, when did zombies become the new vampires? I don't get zombie culture, sorry but I don't. With that said, I love the tv show iZombie. Maybe because it's more like a vampire show then a typical zombie movie? That's my answer and I'm sticking to it. As a non zombie fan, but a vampirologist, I find myself face first sometimes in zombie culture. They do cris-cross, and some can argue are off shoots of the same thing. Yeah, had that argument many many times before. Believe it or not, I am on the side that they are indeed the same thing only really more like cousins then the same species. Anyways, just when did the popular mindset jump off the coffin and onto the brains bandwagon? Must have happened in the last couple of years while my back was turned. Speaking of witches and vampires and all that sort of stuff, I did a post on my movie blog this morning about my thoughts on the remake of the Craft. Just a few lines really. And this is vampire theme week on there as well. That's about all for now...kiss kiss noise. Spudguns! We are in the middle of another Mercury retrograde. Which means technology meltdowns, bad traffic accidents, storms of all kinds, and massive communication mix ups. Remember, this happens three times a year for about 3 weeks each. It's also a time for reviewing. Reviewing contracts, reviewing your goals, reviewing yourself. And that's what I've been doing lately. Reevaluating everything. Every so often it needs to be done anyways right? Right. When I started this blog, I had joined a bunch of online groups, all with the intention of just getting out there more. Online of course. They were suppose to be support/friendship communities but they ended up mostly being ratings pushes. I stopped partaking after a few months. It just didn't feel right to me. They kept talking about finding your tribe. Which, is about the only thing I actually agreed with. Sort of. Finding your identity and going with it. Five years or so later and I'm still not in any "tribe" that I'm really aware of. I'm just too weird. Too me. And that's what I wanted Domestic and Damned to be. Me on a plate. A large onyx plate covered in bats and coffins...Only it ends up the older I get, the less weird I really am. I'm part of the Twin Peaks generation, and my younger sister is part of the Nightmare Before Christmas generation. We both fall squarely into that whole Addams Family generation that seemed to sprout up in the last twenty years. And we just keep on trucking. At one point, I had an idea, vision almost, of this blog being a Martha Stewart style how to blog with a vampiric twist. yeah that didn't really happen. Ends up, I'm terrible at the do it yourself stuff. And the older I get, the more I see it's not unique at all. In fact, it's a large genre all its own. So, not as weird as I have always been led to believe I am. So sad when you think about it, rip my soul's rug out from under me letting me smash my skull on the edge of the crypt on that one...anyways, just waiting for the coffee to be ready, which given the fact I drink instant means me admitting that I haven't gotten off my arse yet to boil the water is a sad sad thing too, and thinking out loud that this blog needed a little something other than just the tarot videos I've been doing as of late; which I still have a few to post down the line. The remake of the Craft...seems to be a big topic last few days with the broomstick crowd. I might have to really think about it before I chime in...or you know just open my mouth like I always do and let whatever drip out. But I think I will make that a whole post on it's own later. So why might you be asking, the two separate Buffy the Vampire Slayer quotes for the title...why not? Here's the next installment in my tarot series. Again, from February 2015, this one has to do with the 3 of Cups and the Page of Cups. 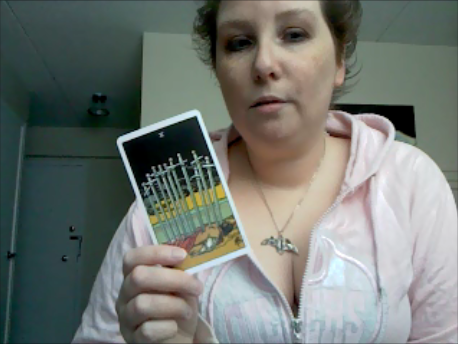 I am working on some new themes for videos, I know I need to be more relaxed with the way I present the tarot. Somewhere along the last few years I lost myself. So, yeah...I'm also trying to figure out a way to bring some of my other blog topics into video form, without it being too...well too. Spudguns! Yes, I am trying to get back to writing on this blog in a more regular fashion. So you know we have yet another Mercury retrograde coming up next week right? No? You didn't know that? Well, we do. They happen three times a year. And it messes with your communications, your technology, and travel. So expect your widgets and gadgets and flights etc to break down next week. Here's the kicker, they last for about 2 and a half -three weeks at a time too. I didn't want to just slap another of my tarot videos in the post, not today anyways. I do, however, have five or six more on my youtube that I did few months ago, and will be adding them over the course of things. With plans to make a few videos just for the movie blog. At some point...soon. Some of which will be cooking related. Until then...I would say more, but I know I will start ranting about the fact NBC cancelled Constantine. So, I'll just end it here for today. Spudguns! I'm back, and here's another video I did back in February 2015. I talk about the lovers card and the devil card. I've been thinking about how to bring some life back to this crypt, and I think sharing some of my tarot stuff might be a good start. I've been doing some tarot videos the last few months, trying to improve my speaking skills, and just wanting to get back to doing videos in general. Here's the first one I did back in February 2015. Have I told you all lately that I joined Food n Flix? Once a month, a lucky blogger gets to host and pick a movie, and the rest of the group watches it, cooking/baking something that the movie inspired. It's been going on for a few years, but I just started this past January. So far, for 2015 we've done Bridget Jones's Diary, Lady and the Tramp, The Quiet Man, Chef and coming up in May, The Goonies. I'm really looking forward to that one! So if you want to see what kind of dishes I've been coming up with and what parts of the movie inspired me to do so, check out my movie blog more often. And if you're in the Thunder Bay area, and would like to have a tarot reading done, drop me a comment on the movie blog...the comments on here are iffy at best. That's enough self promotion for this post. Been wayyyyyy too long since I logged in here. But...I just saw the craziest thing. A bunch of my screen captures and wrestling photos being used on wrestler fan-sites and profile pages. Sort of cool when you think about it. And we're talking stuff from when I was first blogging about TNA- namely Mr. Shelley and Mr. Sabin. Damn, I miss seeing them on weekly tv. Spudguns! Most of you by now, I'm sure, are aware that my movie blog has become my main stay the last year or so. And yes, I still talk about wrestling on my wrestling blog. Speaking of title belts... okay we weren't but why not...I'm totally digging the fact that Seth Rollins has managed to get the title at maina. Dude! Love that! Just wish he'd pick one colour and stick with it. And if you don't follow my movie blog, you should because I joined Food n Flix this year, and every month a different movie is picked, and the lot of us watch it, then cook/bake something inspired by the movie. So yes, my cooking is better then it used to be my lovely Spudguns! That about covers it for now. Creeping Screams!